Reach Paradise: Friendship Ratings Through the Roof! 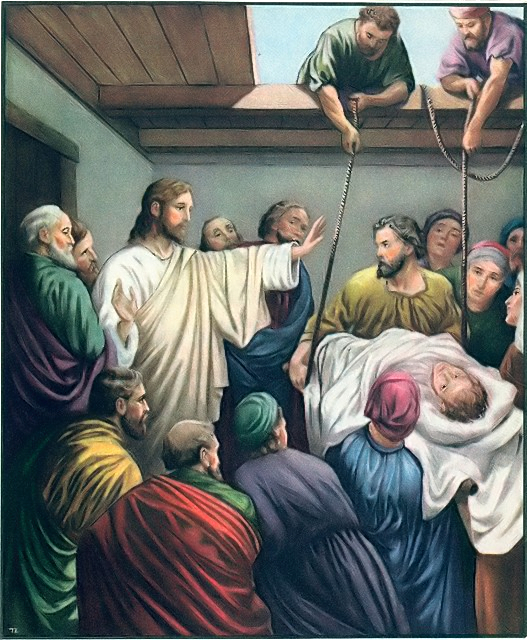 I've heard today's Gospel about Jesus healing the paralytic plenty of times. And I've always focused on the fact that Jesus told this guy his sins were forgiven before he physically healed him. When I was younger, I was as baffled by that as the scribes were. I've learned much since then (cough cough), but I still focused on that line because it always reminded me how much more important our spiritual health is vs our physical one. However, today I saw this reading in a different light. Today I saw great friendship. The four gentleman who carried the paralytic are pretty much an afterthought as the focus of this story shifts from the sick man, to Jesus, to the scribes. They are nameless, but what they did is pretty remarkable! First, the fact that they even associated with the paralytic says a lot. Paralytics were looked down upon, and their sickness was viewed as a symptom of sin and punishment. Second, instead of rushing to try and hear Jesus before the crowd got too big, they went and fetched their friend. That probably took real discipline. In addition, while we don't know how far they were from the house Jesus was at, carrying the man to it couldn't have been a walk in the park. Third, when they got to the house and realized there was no chance of walking in through the door, they did not give up. Fourth, while Mark mentions that these four men lowered their friend through the roof, he glosses over the chore that must have been! Assuming this was a typical Jewish house with an upper room and flat roof, there were probably stairs or a ladder already attached to the house. I'm not sure how you carry a paralyzed man up a ladder - or steps - even with help. But I'm guessing it wasn't easy. Fifth, while the typical house probably had a door to enter and exit the roof area, its hard to tell from Mark (or Luke) if they had to make the hole larger by digging (if mud and thatch) or removing tiles. And even if Jesus was preaching from an upper room, lowering the paralytic down from the roof was yet another physical feat. I wonder what their reaction was like after their friend was healed. I imagine it was a mix of great awe that they witnessed a miracle and great happiness that their friend was healed. Did they hang around to listen to Jesus? Did they become followers? Spread the news? Or just go back to their normal lives, thanking the Lord for that day? But I do know that I need to find friends like them! I wonder if the house owner had house insurance against vandals breaking his roof. Seriously though ... when we're too weak and tired to pray for ourselves, or when our Faith is really battered, that's when we should rely on the prayers and Faith of others. Michael, yes, we were on the same wavelength. Great reflection. God bless. Michael the thing I just love about your posts is that you always give us food for thought. I like the way you look at new ways of seeing things. I hope you have a wonderful week. God Bless you and your family! I never thought about the friendship between the men and the paralytic like that before. This is very interesting & illuminating... Friendship is something I've been thinking about lately & I didn't see this story as being an example of friendship as well as God's healing until I read your reflection. :) So thanks for this new appreciation! Thanks for your comments. It never ceases to amaze me how many different things we can learn from the same readings! P.S. Victor, thanks for the smile. Just think of what would have happened if his friends had NOT done this - he would have stayed paralyzed most likely. Goes to show how important it is that we intercede and help one another. Great post, Michael!